I have to admit that I personally didn’t love this book, but it has simple text and bold pictures (and I couldn’t find anything better)….so I read it for storytime. And the kids thought it was great! They were intrigued by the space suits, and space shuttles, and floating while sleeping. I’d definitely include it in storytime again. Have everyone crouch down on the ground and put their hands (palms together) over their heads and pretend to be a rocket ship. Here come the engines….rumble rumble (wiggle wiggle). We’re getting ready to take off. Let’s count down. 10, 9, 8, 7, 6, 5, 4, 3, 2, 1, BLAST OFF! (jump high in the air) Repeat. If you’re going to the moon, wear your boots. 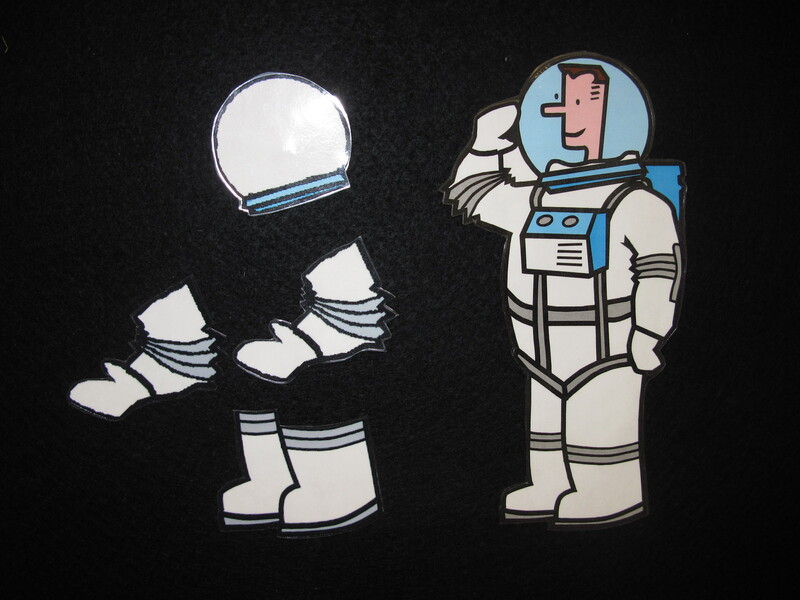 Credit: Mel’s Desk, where you can get her Astronaut Clipart. Scroll down to the comments section where Anne from So Tomorrow has posted a color PDF. I love, love, love this flannel board and song! I’ve been singing it all morning. The flannel board inspiration came from Loons and Quines @ Librarytime and the pattern came from Alljoinin. 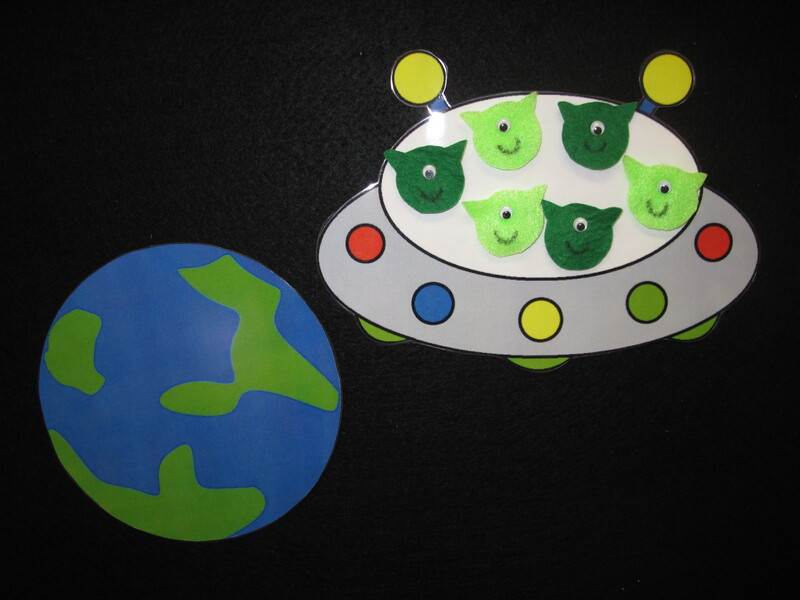 I printed out the earth and space ship, and laminated them. But I really liked the flannel one-eyed aliens from Loons and Quines, so I made them out of flannel too. I was going to just sing this, but after finding the version from Juice Music, I had to use it. We all stood up, practiced looking LEFT and looking RIGHT, and danced to this one with some simple hand motions. I had trouble finding good space books for toddlers, and just happened to come across this gem. A little girl keeps asking her dad to push her “higher, higher!” on the swings. She goes past a giraffe, tall buildings, an airplane, all the way up into outerspace where she meets an alien also swinging. There aren’t many words other than “higher, higher,” but it’s a great read aloud because you can ask the children: “How high is she now?” “Do you think you could swing that high?” etc. Sometimes is nice to include an old favorite that everyone knows. We sang this with simple hand motions. If you need a refresh, here’s a short video to watch. This was a good reminder that sometimes simple is best. I didn’t have a craft prepared for this week, so I did a google search and found some space themed coloring sheets (rocket, astronaut, alien, winnie the pooh astronaut, etc.) I was worried that they would miss the craft, but the kids were so happy to just color today!